The brain is the most complex organ in the human body. The human brain is the command center of the human nervous system. It receives information from the sensory organs and sends output to the muscles. While we have learned more about the brain in the past 10 to 15 years than all of human history, we still have a long way to go. Even experts agree that there is more that we don't know about the human brain than we do know. 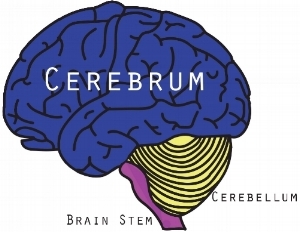 The cerebrum is the largest part of the human brain-- in fact, it makes up about 85 percent of the brain's weight. The cerebrum consists of the left and right hemispheres. These hemispheres share information with each other thanks to a thick bundle of nerves that runs in between them called the corpus callosum. Underneath the cerebrum lies the brain stem and the cerebellum. The brain stem connects to the spinal cord and is responsible for relaying information between the brain and the body and controlling the heart, breathing and consciousness. The cerebellum plays a role in coordination and balance, as well as cognitive functions, like attention and language. Frontal Lobe: This lobe is located at the front of the brain and is associated with reasoning, motor skills, higher level cognition and expressive language. The motor cortex is located at the back of the frontal lobe, and is responsible for carrying out body movements. Damage to the frontal lobe can lead to changes in socialization, attention, sexual habits and increased risk-taking. Parietal Lobe: This lobe is located in the middle of the brain and is associated with processing tactile sensory information, like pressure, touch and pain. This lobe is home to the somatosensory cortex, which is crucial to the body's processing of senses. Damage to the left parietal lobe can cause right-left confusion, difficulty with writing (agraphia), difficulty with math (acalculia) and language disorders (aphasia). Damage to the right parietal lobe can lead to the impairment of self-care skills such as dressing or washing, and deficits in construction and drawing. Damage to both sides of the lobe can lead to an inability to voluntarily control one's gaze. Temporal Lobe: This lobe is located near the bottom of the brain and houses the primary auditory cortex, which interprets sound and language. The temporal lobe is associated with the formation of memories. Damage to the temporal lobe can lead to problems with memory, speech and language skills. Occipital Lobe: This lobe is located at the back of the brain and is associated with interpreting visual stimuli. The primary visual cortex is located in the occipital lobe, and is responsible for receiving and interpreting information from the eyes. Damage to this lobe can cause visual problems, such as difficulty recognizing objects, trouble recognizing words and an inability to identify colors. The brain also includes many complex structures that help us to function. Thalamus: The thalamus consists of nuclei that receive different sensory and motor inputs and relays signals to various areas of the cerebral cortex. It also regulates consciousness, sleep and wakefulness, feeding, satisfaction and alertness. Hypothalamus: Similar to the thalamus, the hypothalamus is also made up of different nuclei with varying functions. It regulates the autonomic nervous system by producing and releasing hormones. It can also regulate sleep cycles and respiration. Hippocampus: The hippocampus is essential for long-term memory formation. The loss of function to the hippocampus results in the inability to form new memories. Amygdala: The amygdala is the center of emotion and motivation. It is responsible for reactions to fear and fearful situations. The amygdala is also involved in the process of turning a memory into a long-term memory, and has also been linked to aggressive and sexual behavior as well as anxiety. 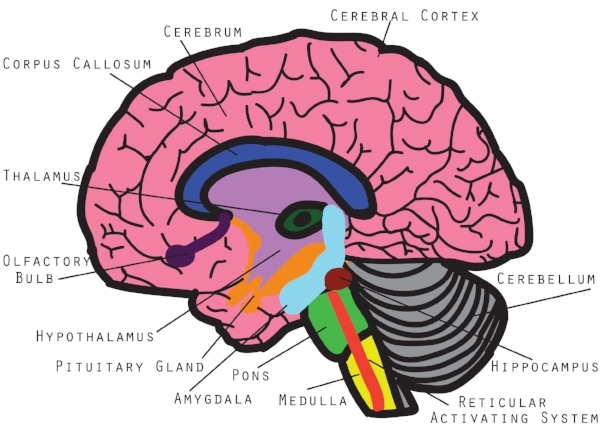 Medulla: The medulla controls involuntary functions of the body, such as breathing, heart rate and blood pressure. Pons: The pons is a part of the brainstem that regulates functions that include hearing, taste, equilibrium, movement and facial sensation. Olfactory bulb: Responsible for the sense of smell. Pituitary gland: The pituitary gland controls the body's hormonal system. It secretes hormones from the front and back of the gland, and is controlled by the hypothalamus. Reticular activating system: The reticular activating system is a network of nerve pathways in the brainstem that connect the spinal cord, cerebrum and cerebellum. It also mediates the overall level of consciousness.